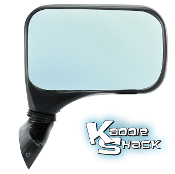 Quality replacement mirrors look just like the originals and are easy to replace. 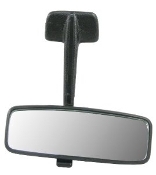 Time to replace that old crusty worn out rear view mirror? 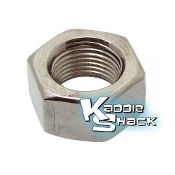 This is a nice replacement that will work well and help keep you driving safely. 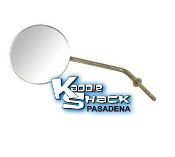 This replacement mirror is the highest quality OEM equivalent we have available. 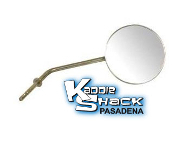 This attractive mirror adds a little zing to any VW Bug. It features Italian style Baby Turbo design, without the Italian price. The blue tinted glass reduces glare, and its exclusive base design assures proper fit to the Type 1 bug. Universal fit, left or right. 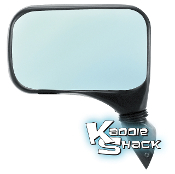 This attractive mirror adds a little zing to any VW Bug. It features Italian style Baby Tornado design, without the Italian price. The blue tinted glass reduces glare, and its exclusive base design assures proper fit to the Type 1 bug. Order left or right. 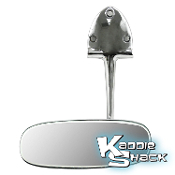 Replace your stripped or broken hinge pin, add a mirror on the right side, or convert your late model bug to early style mirrors.